President Donald Trump’s choice to lead the Justice Department comes with a track record that signals he could take a softer stance in policing mergers and promote a more business-friendly approach to prosecutions. William Barr, the nominee for attorney general, spent 14 years in senior leadership at Verizon Communications Inc. and a predecessor, GTE Corp., before serving as a director at companies including Time Warner Inc. and hedge-fund firm Och-Ziff Capital Management Group. That experience would make him the first attorney general in decades to bring an extensive corporate background to the nation’s top prosecutorial post and potentially sets up a sharp turn from former Attorney General Jeff Sessions, who devoted much of his two-year tenure to cracking down on illegal immigration and opposing the legalization of marijuana. Barr would join a string of Trump cabinet heads who are rolling back regulations across the U.S. economy, from telecommunications to the environment. Barr also says he’d let Special Counsel Robert Mueller “complete his work” and that he’d provide Congress and the public as much of the findings in the Russia probe as possible. An establishment Republican who previously served as attorney general under former President George H.W. Bush, Barr begins a two-day Senate confirmation hearing on Tuesday. The Republican-controlled Senate is likely to confirm him, handing him wide-ranging influence over companies through his oversight of merger reviews, financial fraud and foreign bribery cases. Barr, 68, would return to the top job at a time when the department is juggling a number of high-profile investigations, including General Electric Co.’s $22 billion accounting charge in its power-equipment unit, allegations of foreign bribery by Airbus SE, and a years-long inquiry into corrupt payment allegations by Walmart Inc. Its biggest merger investigation is T-Mobile U.S. Inc.’s proposed $26.5 billion takeover of Sprint Corp.
“He would be more likely to take a hands-on approach to corporate criminal cases and investigations than his predecessor,” said George Stamboulidis, a former federal prosecutor and now co-chair of the white-collar group at Baker & Hostetler LLP in New York. Given his experience in business and government, Barr will also likely have a larger say in changes to corporate enforcement policy, he said. As Bush’s attorney general, Barr came under fire for not appointing an independent prosecutor in a sprawling bank-fraud scandal known as Iraqgate that involved the funneling of funds to that country. At the time, Barr also oversaw the department’s prosecutions stemming from the savings and loan crisis and a revitalization of antitrust enforcement following a pullback during the Reagan administration. Barr had a front-row seat to major telecom deals after leaving the department. As general counsel at GTE, he worked on the company’s sale to Bell Atlantic and fought the merger of WorldCom and MCI, according to his Senate questionnaire. The GTE-Bell Atlantic deal formed Verizon, where Barr served as general counsel and worked on Verizon’s acquisitions of MCI and Alltel. While at Verizon, Barr opposed net neutrality rules that prohibited broadband providers from slowing or blocking internet traffic, arguing they would deter investments by telephone and cable companies to improve internet service. Net neutrality regulations were implemented during the Obama administration and abandoned last year by regulators under Trump. Barr’s corporate background, which includes a stint consulting for BP Plc on the Gulf of Mexico oil spill, will benefit the department’s work, said George Terwilliger, a lawyer at McGuireWoods LLP in Washington who served as deputy attorney general under Barr. “Understanding how businesses and major corporations actually work internally is a helpful perspective when judging the conduct of those kinds of organizations,” he said. 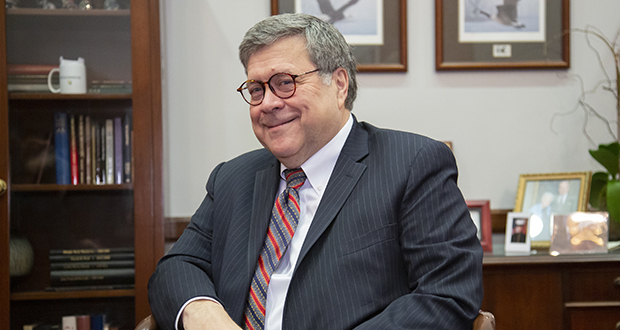 Barr also served on Time Warner Inc.’s board of directors when the company was sold to AT&T Inc. That position put him in conflict with the Justice Department’s antitrust chief, Makan Delrahim, who unsuccessfully sued to stop the sale last year. The Time Warner case marked a radical shift in how the department polices mergers between companies that operate in different part of a supply chain, known as vertical deals. The lawsuit was the first time in decades the government went to trial to stop such a deal. Trump opposed the AT&T-Time Warner merger, vowing to stop it when he was a candidate. Before the lawsuit was filed, Barr and Jeff Bewkes, Time Warner’s chief executive officer at the time, met with Delrahim and two of his deputies to try to reach a settlement. Barr told them that the antitrust division’s model predicting higher pay-TV prices for consumers from the deal “was insubstantial, unrealistic and bore no relationship to how the media and telecommunications marketplaces actually function,” according to a court filing Barr made in the case. Barr told Sen. Amy Klobuchar, a Minnesota Democrat, that he will recuse himself from the case, which is pending appeal. Still, his views could signal more openness to vertical deals in media and telecom industries going forward, according to Dan McInnis, an antitrust lawyer at Thompson Hine LLP in Washington. “It makes it more likely that DOJ’s reaction to losing the AT&T case is to soften their position on vertical deals rather than double down,” he said. Barr will have the ultimate say on whether the department allows T-Mobile to buy Sprint or files a lawsuit seeking to block the merger. The deal would further consolidate the U.S. wireless market by uniting the third- and fourth-biggest carriers. Consumer groups want the government to challenge the deal because they say it risks raising consumer prices by cutting the number of national competitors to three from four. Barr supported vigorous antitrust enforcement the last time he was attorney general, according to Jim Rill, who led the antitrust division under him. He supported an initiative to broaden the division’s reach overseas. Under the Reagan administration, the department took a position that it should only be concerned with anticompetitive conduct in foreign markets that had a direct effect of raising prices for U.S. consumers. Barr ditched that position so that antitrust enforcers could target competitive restrictions overseas that harmed U.S. exporters. Barr would take over a Justice Department that’s already made several changes under Sessions that make it easier for companies to avoid criminal charges or massive penalties. Sessions, a former senator from Alabama, barred the department from imposing penalties in corporate cases that required payments to third parties. Such payments were the crux of multi-billion-dollar settlements with Wall Street banks during the Obama administration over the sale of toxic mortgage bonds that fueled the 2008 financial crisis. During his tenure, the department sought to prevent multiple agencies from issuing penalties for the same wrongdoing. It also made it easier for companies to avoid criminal charges by self-reporting potential violations of the Foreign Corrupt Practices Act, which prohibits payments to foreign officials to obtain or retain business. Those are policies Barr is likely to continue.